Expert-led training on Windows 7 administration, desktop administration and PowerShell. This training course is meant to examine Windows 7 and its features to new Windows 7 administrators, Windows 7 developers and anyone else wanting to learn about Windows 7. It's meant to get you started, expand your knowledge, and can also help you take your skills to the next level. Anyone else who wants to learn Windows 7 and already knows the basics of Windows, TCP/IP, and networking will also benefit from the training course. However, it is important that you have a good background in computers beforehand and preferably, several years experience as a Windows user. 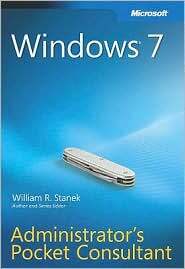 This class provides the essential core knowledge of Windows 7 needed to be a successful administrator. It covers everything from configuration to system restore to Windows Firewall. This training seminar is not meant as an examine prep but does cover most of the same skills tested on the Windows 7 exams. Perform and troubleshoot an attended installation of Windows 7. Perform and troubleshoot an unattended installation of Windows 7. Install Windows 7 by using Remote Installation Services (RIS). Install Windows 7 by using the System Preparation Tool. Create unattended answer files by using Setup Manager to automate the installation of Windows 7. Upgrade from a previous version of Windows to Windows 7. Monitor, optimize, and troubleshoot performance of the Windows 7 desktop. Configure Windows 7 for multiple locations. William R. Stanek (williamstanek@aol.com) has over 20 years of hands-on experience with advanced programming and development. He is a leading technology expert and an award-winning author. Over the years, his practical advice has helped millions of programmers, developers and network engineers all over the world. He has written over 50 computer books, which are sold all over the world and there are more than 3 million copies of his books in print. Current or forthcoming books include Windows Server 2008 Inside Out, Windows Command-Line Administrator's Pocket Consultant, Windows Server 2003 Administrator's Pocket Consultant 2nd Edition, Windows Server 2008 Administrator's Pocket Consultant, Windows 7 Administrator's Pocket Consultant and IIS 7.0 Administrator's Pocket Consultant. Speed and ease of reference is an essential part of this hands-on guide. The book has an expanded table of contents and an extensive index for finding answers to problems quickly. Many other quick reference features have been added as well. These features include quick step-by-step instructions, lists, tables with fast facts, and extensive cross-references. Chapters 1 to 5 cover the fundamental tasks you need for Windows 7 administration. Chapter 1 introduces key administration tools, techniques, and concepts. Chapter 2 covers customizing system and environment settings. Chapter 3 explores hardware and device management. Chapter 4 focuses on customizing the Windows desktop. Chapter 5 discusses how to install, manage and maintain programs. Chapters 6 to 11 focus on the essential tasks for managing access, permissions, and more. Chapter 6 discusses techniques you can use to manage user access to systems and configure global settings. Chapter 7 zeroes in on administration issues that are specific to laptops and traveling users. The chapter details considerations you should make when configuring laptops, such as power management, hardware profiles, and networking. Group Policy is the subject of Chapters 8. In this chapter, you’ll find extensive lists that tell you exactly what policies you should use to manage permissions, rights, and capabilities. Chapter 9 discusses partitioning, monitoring and optimizing drives. The chapter also details file compression and encryption. Chapter 10 covers working with files and folders with a particular focus on security. Chapter 11 discusses additional file and folder options including offline files, shadow copies and disk quotas. Chapters 12 to 16 zero in on networking techniques and tasks. Networking is the subject of Chapter 12, which examines local area network settings. You’ll find a complete discussion of installing and configuring TCP/IP networking. The chapter also covers troubleshooting networking and provides steps for performing detailed network diagnostics. Chapter 13 moves from corporate network environments to mobile environments, examining dial-up networking, wireless client connections and remote access with virtual private networks (VPNs). Chapter 14 explains how to configure advanced Internet options and security, such as default applications, trusted sites and security zones. You’ll also learn how to customize Internet security settings through Group Policy. In Chapter 15, you’ll learn how to improve system performance, optimize drives, and enhance data security. In Chapter 16, you’ll learn how to use Remote Assistance to remotely troubleshoot problems with devices, applications, and the Windows operating system itself. You’ll also learn how to troubleshoot problems with startup and shutdown, and how to backup and recovery a computer. Hopefully, after reading these chapters, you’ll be able to improve the overall experience of your users and reduce downtime.